We have the making of truly a great year ahead of us while maintaining our costs down and providing first-class racing at an affordable price. Whether you are Pro racers, Sportsman or just starting racing your UTV, this is the place for you, this is the series for you and this is where you will sort out all the "gremlins" in your vehicle or in your experience. Sunday, November 18, 2018 – California City, CA – AVE/BP Racing released it’s ambitious 2019 event schedule, which features a number of very interesting and innovative ideas. 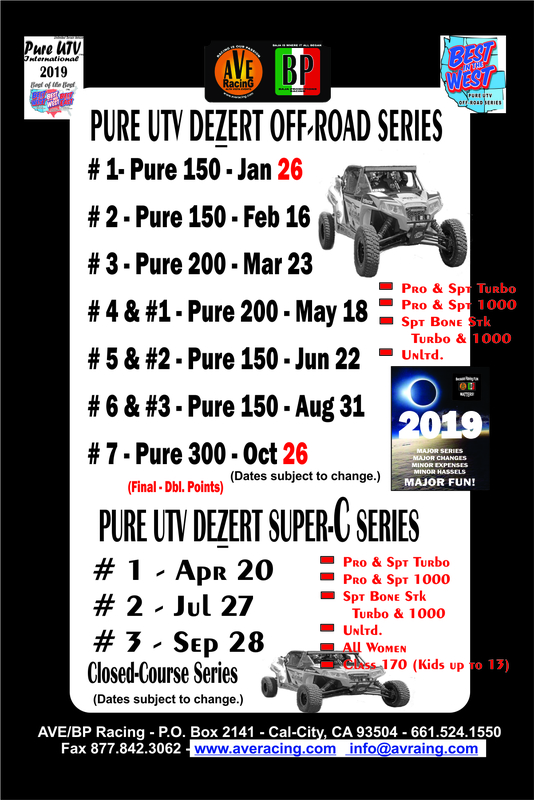 AVE/BP Racing is putting the charity project in motion by pledging to donate $5.00 out of every entry in the 2019 PURE UTV OFF-ROAD DEZERT SERIES. The seven-event series will take place at Alta Vista Ranch, California City-Proper, CA. It’s first event is Saturday, January 26, 2019. The “Racing & Raising Project” will have a special box dedicated to it on the entry forms where racers can donate to the same cause during the year. Any amount is welcomed. In addition, a tally will be kept of all those who donate to St. Jude’s during the year, which will be sorted alphabetically and at the end of the year will be published. There will also be a separate form that any non-racer, whether, family, friend, sponsors or supporter can use to donate on behalf of the Racer & Navigator on the entry. Now for the biggest news: After the last event of the season (November 2019), when AVE/BP Racing crowns the PURE UTV 2019 CHAMPION DRIVER & NAVIGATOR, the entire Fund will be donated to St. Jude’s on behalf of the Champions and all the people who contributed towards the fund during the year. All donations are tax deductible. Look for the special box in every AVE/BP Racing entry form with the St. Jude logo and also a separate form for crew members, families and supporters, during the exciting 2019 event season.